Chronic dry eye disease is a debilitating disease for people who just want to go about their daily lives without the common dry eye symptoms of burning, itching and inflammation. Xiidra is one of the medications used to treat this disease, and it is prescribed by an Ophthalmologist or an Optometrist. A chronic dry eye exam may be necessary in order to be prescribed Xiidra eye drops. The cost of Xiidra varies, but it can be expensive out of pocket since a generic has yet to be marketed. There are a few other options for chronic dry eye medications that can be prescribed, or you can use over-the-counter eye drops if your dry eye condition is mild. Searching for a more natural alternative? 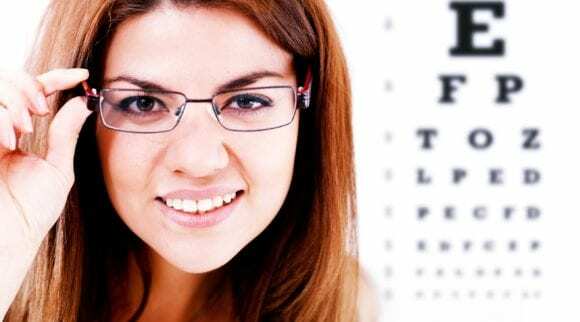 Keep reading to learn more about chronic dry eye disease and your treatment options. Chronic dry eye disease is a lack of natural tears or an evaporation of natural tears. 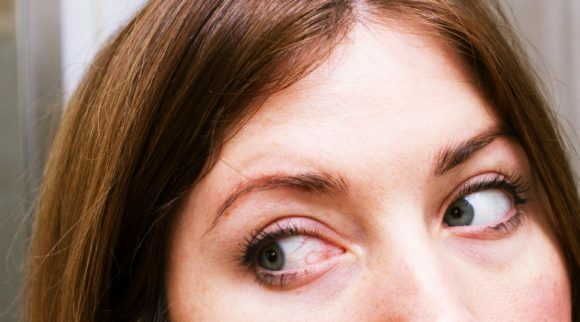 The eyes do not get lubricated properly resulting in itchy, red, inflamed eyes. Tears not only help us see but also protect the surface of the eye. Chronic dry eye is more prevalent in older adults but can affect all ages. People that are diagnosed with dry eye either have a low number of tears or tears that are poor quality. Tears have three layers: an outer oily layer, a middle watery layer, and an inner mucus layer. Environmental conditions can increase your chances of dealing with chronic dry eye such as climates where the air is dry or it is windy. They can cause tears to evaporate too quickly and affect the glands in the eyelids, causing dryness. Chronic dry eye medications aim to maintain current tear production or even increase the number of tears you produce. Producing a normal amount of healthy tears can prevent dry eye and the discomfort that comes with it. 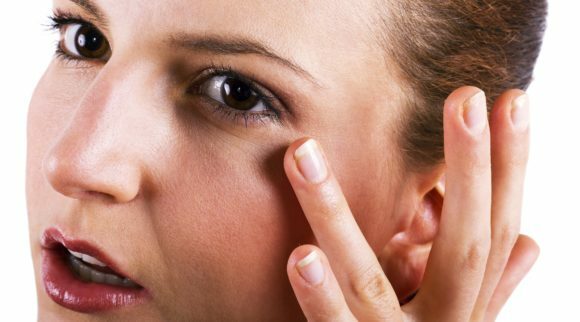 There are several reasons for developing dry eye. Tear production can reduce with age and pre-existing medical conditions, and some medicines can even cause tears to dry up. The older you get, the less tears you produce. The majority of people over 65 have at least some of the symptoms of dry eye. Women are more likely to experience dry eye due to hormonal changes. These changes can also occur when taking birth control, with pregnancy, and even with menopause. Medications taken for allergies, blood pressure, and depression are some of the main culprits as well. People that have been diagnosed with rheumatoid arthritis, diabetes, and thyroid imbalances are also at a greater risk of developing chronic dry eye. Frequent exposure to smoke (whether you are a smoker or exposed to second-hand smoke) can increase your risk. Even if you simply use a computer for work and do not blink regularly, you may experience symptoms of dry eye. If you think you have the symptoms of dry eye, you will want to contact your Optometrist right away. You will need to be tested for the quantity and quality of your natural tears. In order to do this, specific steps will be taken to confirm the diagnosis. First, your medical history will be taken into account. Your doctor will factor in any current symptoms, pre-existing conditions, medications you are taking, and the climate that you primarily live in. The doctor will then look at your eyes externally to evaluate the lid structure and if there are any issues when you blink normally. Your eyelids and cornea will also be tested using light and magnification to clearly rule out any issues. Finally, tears are tested for quantity and quality. A special dye is used to track your natural tears for strength and flow. The doctor will easily be able to see if there is an issue with your natural tear structure and how to best improve it. After all testing is complete, your doctor will be able to determine the best course of action. Some patients will have mild dry eye and will be able to use over-the-counter medication or have a simple procedure completed to suppress dry eye symptoms. If you need added tears, an over-the-counter artificial tear product will be suggested. The advantage of this diagnosis is that artificial tears can be used on an as-needed basis. There are also preservative-free options, which are much safer for your eyes in the long-term than prescription medications for dry eye. If your eyes do not respond to artificial tears or become immune to their benefits, you will need to take additional action. A procedure that requires removable or permanent tear duct blockers may be suggested. Tear duct plugs help keep natural tears in the eyes longer, thereby increasing the comfort of the eyes. Even with artificial tears and tear duct plugs, you may need to frequently use warm compresses, lid massage, or eyelid cleansers for long-term eye comfort. This will help decrease inflammation around the eyes and remove any dirt or dust that could be causing additional dry eye symptoms. Additional additives in prescription medications can irritate the eyes which can stall your condition from improving. Other treatment options include eye drops that increase tear production. One of the prescription treatment options is an eye drop solution called Xiidra. 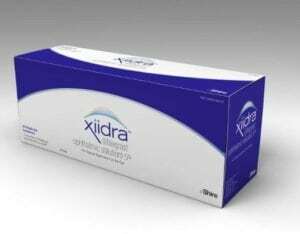 Xiidra is a prescription medication that is used to treat dry eye disease. 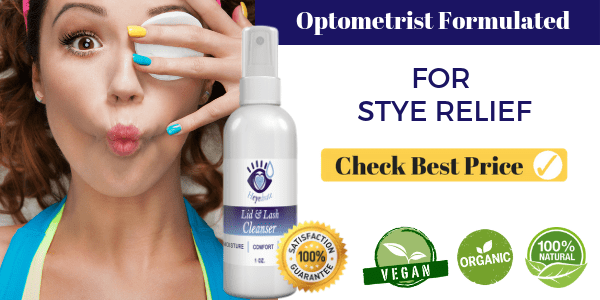 It is in the form of an eye drop solution, and it is normally prescribed to a patient that is still struggling with chronic dry eye after an artificial tear product and eyelid hygiene have been tried. Xiidra has not been fully tested for safety in use for those less than seventeen years of age. The active ingredient in Xiidra is lifitegrast. Lifitegrast (Xiidra) is FDA approved to treat the symptoms of dry eye, also known as keratoconjunctivitis sicca. It inhibits inflammatory cell binding by reducing the inflammation associated with dry eye. Lifitegrast blocks a protein on your cell’s surface to increase tear production. If left untreated, this protein can block adequate tear production, resulting in dry eye. Inactive ingredients include sodium chloride, sodium phosphate dibasic anhydrous, sodium thiosulfate pentahydrate, sodium hydroxide and/or hydrochloric acid (to adjust pH), and water for injection. Xiidra is patented and manufactured in the USA. This medication should be stored at room temperature preferably between 68-77 degrees Fahrenheit. Xiidra is packaged in a foil pouch and individual vials. Keep the eye drops in the foil package until you are ready to use so that the light does not cause Xiidra to be ineffective. Do not open until ready for use and return any unused containers to the foil pouch for later use. As with all medications, keep Xiidra stored away from children. Xiidra is for people who are currently suffering from chronic dry eye syndrome and want relief from dry, itchy eyes. It is unlikely that Xiidra will interfere with any medications you are currently taking; however, you should tell your doctor if you are taking any prescriptions, over-the-counter remedies, or supplements just in case your doctor or pharmacist spots a conflict. Always use prescription medication in the way it was intended for your specific situation. Before using Xiidra for dry eye, wash your hands to prevent any bacteria from entering the eyes. If you are currently wearing contact lenses, the lenses will need to be removed before using Xiidra. Do not let the tip of the Xiidra container touch your eye or any other surface. Each Xiidra dosage is packaged in a single-use container. The container is filled with enough medicine to put drops in both of your eyes one time. Though you will notice that after you put one drop in each eye, there will be some medicine left over in the container; this is only needed when the eye drop misses one or both of your eyes. If you correctly put a drop in both of your eyes, throw away the unused Xiidra. Unused Xiidra should not be stored for any reason. 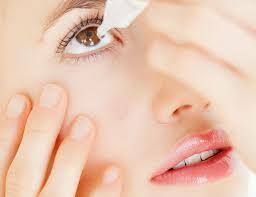 It is recommended that you place one drop in each eye every twelve hours (or twice per day). To correctly use Xiidra, open the box you receive from the pharmacy. There should be foil pouches in the box. Open one of the pouches and take out the row of containers. Remove one container from the row. It is very important that you put the remaining containers, which should be connected together, back in the foil pouch. Fold over the unused portion of the pouch to seal it. Pick up the single-use container you removed from the pouch and hold it upright. Gently tap the top of the bottle until the solution moves from the top to the bottom. You should be able to see all of the solutions below the top of the container. Twist off the tab at the top of the container. This is where you make sure that the tip of the medicine container does not touch any surface to prevent contamination and bacteria. It is best if you tilt your head back to administer Xiidra. If you are unable to tilt your head, you will need to lie down to take the medication properly. Gently tug on your lower eyelid so that it is pushed downward and forms a shallow pocket. Look up and place the top of the open container near your eye – but not on it. 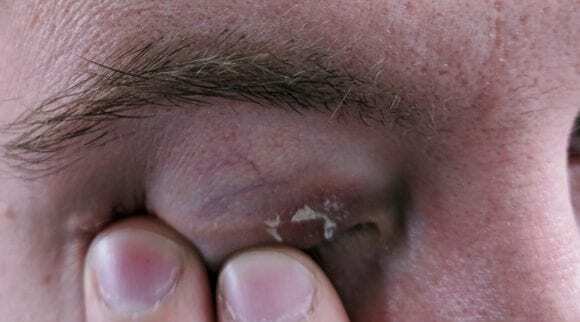 The tip of the container should not touch your eye. Squeeze the container until one drop releases and hits your eye. Only one drop is needed. If you blink or you miss your eye completely, there is enough medication in the container to try again. Repeat these steps for your remaining eye. You should only need to use one container of Xiidra for each application to both eyes. Once you have successfully squeezed a drop of Xiidra in both eyes, discard the open container. Do not share Xiidra with friends or family members. Giving Xiidra to someone who doesn’t need it could cause unnecessary eye discomfort. If you know someone who is experiencing dry eye symptoms, encourage them to seek medical help. 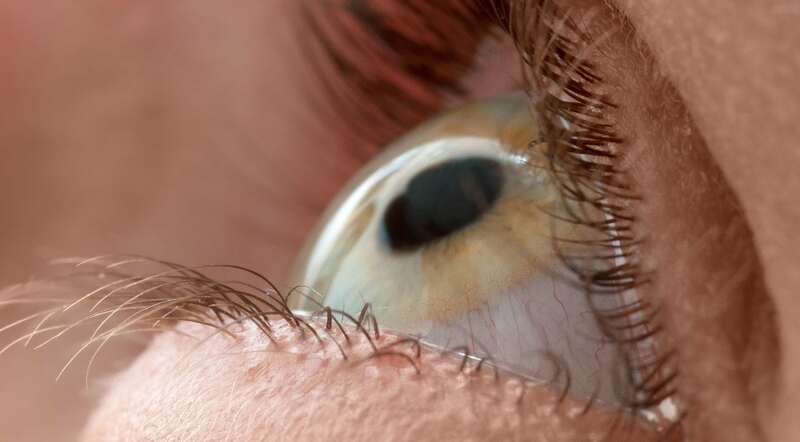 Contact lenses and prescription dry eye medications do not mix. It is important to read the warnings and instructions if you are a regular contact lens wearer. If you wear contact lenses, do not place them back onto your eyes until you have waited at least 15 minutes after applying Xiidra. Xiidra is a prescription medication that is intended to treat chronic dry eye. It is more potent than over the counter medication. 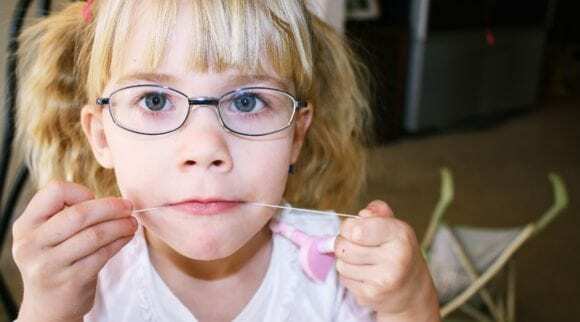 Placing contacts back on your eyes too soon after using Xiidra could result in the medication not being able to comfort the eyes, and it may also cause burning and problems focusing. What are Xiidra side effects? Talk with your doctor about the pros and cons of using Xiidra, as well as potential Xiidra side effects. You will need to notify your doctor if you are currently using any eye drops whether they are over the counter or prescription, wear contact lenses, are pregnant, have plans to become pregnant (Xiidra has not been studied in pregnancy and could or could not harm an unborn baby), or if you are breastfeeding (it has not been studied whether Xiidra can pass through breast milk or not). As with any medication, there are some Xiidra side effects noted in studies. The most common Xiidra side effects are eye irritation or discomfort, blurred vision, and dysgeusia (unusual taste sensation). There could be additional side effects of Xiidra that have not been studied. If you have difficulty breathing, begin wheezing, or have a swollen tongue after taking Xiidra, seek immediate medical care and discontinue using the medication. Side effects not listed above can be called in to the FDA at 1-800-FDA-1088. Medicines should only be taken for their intended purpose. Ask your doctor or pharmacist if you have any questions regarding Xiidra before taking the medication. Do not share your medication with others even if they are exhibiting the same symptoms. How much does Xiidra cost? Xiidra is not covered by Medicare. Depending on what insurance company and plan you currently have, your co-pay could be in the range of $40 to nearly $600! It is recommended that you talk with your insurance provider or pharmacy before choosing Xiidra. If your co-pay is on the high end, there are discounts available to help you afford your medication. Keep in mind that there is no current generic form of Xiidra. Without a low-cost alternative available, you will be paying top dollar, as the Xiidra cost is pretty high on a monthly basis. If you are commercially insured, Xiidra is more affordable under your plan. You will need to sign up and bring your Xiidra iinsider® card to your pharmacy along with at least a 30-day prescription. If you qualify for the discount, you can get your first 30-day Xiidra prescription for free. If you need to take Xiidra for longer than one month, it will cost you ten dollars a month for the life of your prescription. That brings the total cost to just over $100 per year — which is very affordable prescription coverage. Before starting a dry eye medication regimen, you should consider the monthly cost and make sure you can afford it. Other medication might be available that is more affordable and has better ingredients. Are you worried about the cost of Xiidra and looking for a comparative alternative? Dealing with the pain of chronic dry eye disease is hard enough without having to worry about how you are going to pay for the medication. While there are other prescription chronic dry eye medications on the market, those medications can be costly, too. 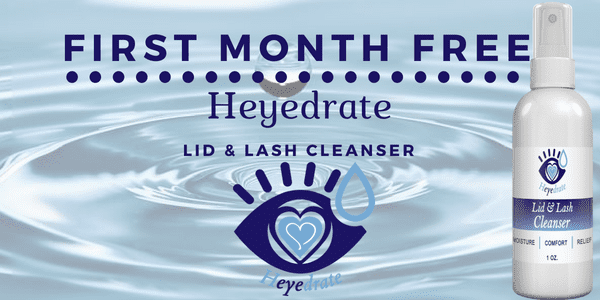 If you are looking for a natural alternative that is better for your eyes, consider purchasing Heyedrate Lid & Lash Cleanser. Heyedrate has many positive reviews on Amazon. 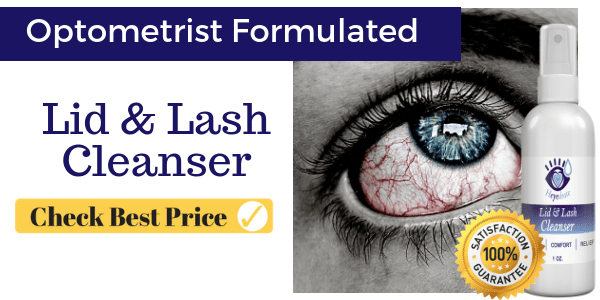 Plus, Heyedrate Lid & Lash Cleanser also helps alleviate Blepharitis (inflammation of the eye lids along the eye lash line, can affect natural tear production), styes, red and itchy eyelids, Melbomian Gland Dysfunction, and contact lens discomfort by keeping the eyelids and lashes clean. The cleanser is organic and vegan. The formula is free of alcohol, fragrance, parabens, sulfates, and preservatives. Since it is all-natural, it is the perfect cleanser for your sensitive eye area. This incredible product has a two year shelf life. 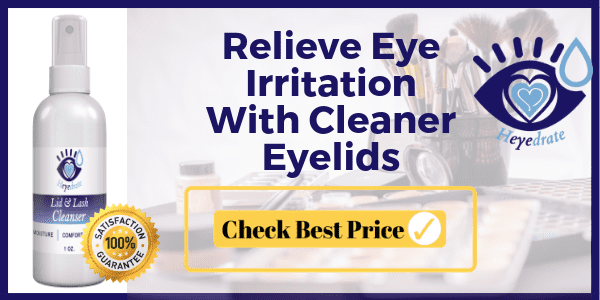 It was originally used to keep bacteria out of wounds and now boasts over a hundred reviews from people who suffer from chronic dry eye syndrome. It is hypoallergenic, can be used wherever skin is present, and is approved for daily use. To use Heyedrate Lid & Lash Cleanser, first clean dirt or makeup from your eyes with a clean cloth. Then close your eyes and spray the Heyedrate cleanser over your eyelids. You can rub it into your upper and lower eyelid or simply let the product dry. Repeat once every twelve hours for best results. Since this formula was created to reduce inflammation, you can use it anywhere you need to combat bacteria or inflammation: your hands, knees, and even your feet for a calming retreat from pain and dryness. You will love Eye Love’s one hundred percent satisfaction money back guarantee. The price is super affordable, and the cleanser is ready to ship when you place your order. Plus, with every cleanser you buy, Eye Love will give an eye exam, glasses and sunglasses to someone in need. It’s a win-win! Did we mention you can get your first month supply for free? Just pay shipping. Click here to claim your limited time free offer. No matter what medication you choose, whether it is prescription, over-the-counter, or natural product, there are habits you can add to your daily routine to keep your eyes comfortable. Drink plenty of water. Water is not only good for your overall health, but it is also good for the health of your eyes. If you are dehydrated, your eyes will be, too. Reach for water the next time your eyes are feeling a little dry. Always wearing sunglasses when your eyes are exposed to the sun is important for overall eye health and vision. If you are outdoors, sunglasses can also protect your eyes from eye drying wind. Make sure your sunglasses cover your whole eye area — the more coverage the better. There are certain supplements that may aid in decreasing dry eye symptoms. If you are experiencing chronic dry eye, consider adding essential fatty acids to your diet. Before starting a regular supplement regimen, it is best to talk to your doctor to make sure the fatty acids you are adding to your diet do not conflict with other medications you are taking. You can also use a humidifier to increase the moisture in the air around you, either at home or at work. Commercial work spaces can be especially dry in nature. Humidifying the air can increase the comfort level of your eyes and skin and can be especially helpful in the dry winter months. Finally, if you use a computer for more than a few hours per day it is important that you blink frequently to refresh the surface of your eyes. Dry eye can also happen when you are reading for long periods of time. Whether you are glued to your computer screen or a good book, take a few minutes every hour to look away from your reading and close your eyes. You will be surprised how well your eyes will feel if you take short breaks throughout the day. Life is too short to suffer from chronic dry eye disease. If you are constantly rubbing your eyes or noticing a lack of tear production, you might have chronic dry eye disease. It is important to see a doctor to determine if you have this disease. Dry eye can also be linked to other conditions such as allergies. Only a trained doctor will be able to determine if you have the disease. There are many options for medication for chronic dry eye including Xiidra. While online Xiidra reviews are less than pleasing, your doctor will be able to prescribe the one that has the most benefits. Side effects are generally mild with this type of medication and, over the long term, can improve your quality of life both at work and leisure by providing more natural tears and eye comfort. However, prescription medications are genetically created and may contain chemicals that have not been studied thoroughly. If you are concerned about the overuse of prescription medications, a natural solution is the route that you should take. Although your doctor may not suggest a natural medication, researching natural alternatives is worthwhile. If you can get the same results from a natural product that is free of alcohol, fragrance, parabens, sulfates, and preservatives, why would you pay more to use a prescription product that might contain harmful chemicals? 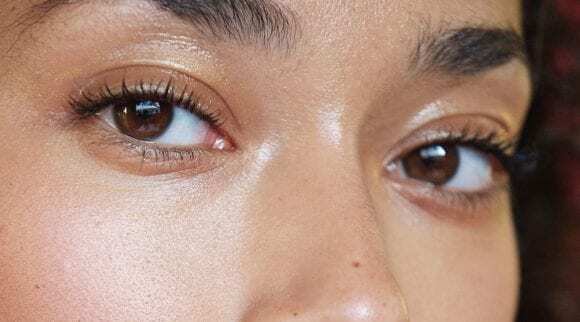 Do yourself a favor and look into the positive benefits of Eye Love’s Heyedrate Lid & Lash Cleanser. Again your first month is free, just pay shipping when you click here. Trying the product could be less expensive than the monthly cost of Xiidra. If you find the cleanser helpful, continue use when you need to refresh your eyes. You might be surprised how well this cleanser works even if you have already been using Xiidra or a similar chronic dry eye medication. As with any medication — natural or prescription — it is best to talk with your doctor before use.